High school students Rain Donovan and Wendy Geller used to be best friends. Rain, born with a cleft palate, always felt “different,” but Wendy had always been the only one who understood her. Wendy loves being the center of attention and after a while, her actions tend toward the outlandish. Because Rain realizes that old adage about birds of a feather and because she does not want others to think she is like Wendy she withdraws from her friend. Taunting the popular girls by going after their boyfriends and making a play for them just to get them angry is one of Wendy’s games, even though she really isn’t interested in them for herself. She also enjoys getting drunk at parties and now her rep as a “party girl” has started following her everywhere. One night, one of the kids from the elite Manhattan school they all attend hosts a get together. Rain runs into Wendy, and the sight is not pretty. Wendy is drunk and on a course to get even with Sasha, a rich girl who has trashed her at school. The morning after the party, Wendy’s mom calls Rain to see if she is there; she has not yet returned home. Tragedy hits hard: Wendy’s body is found in Central Park brutally murdered. Rain suffers extreme guilt, wondering why she had not helped her friend—or at least stuck closer to her when she was inebriated. Rain decides it’s up to her to discover who slaughtered Wendy. The media makes a field day of Wendy’s death, portraying her as a “wild girl” who perhaps invited her fate, but Rain understands the real Wendy. Rain believes Nico is the killer. The boy is known to have a temper, and Rain dislikes him based on a prior bad experience with him. The Girl in the Park, a compelling mystery told from Rain’s perspective. Many readers will relate to these well-to-do teens, portrayed as often damaged and uncertain, searching for identity in a privileged world where money talks and values are skewed—and not for the best. 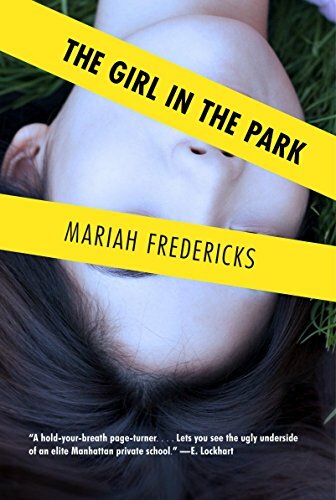 The Girl in the Park by Mariah Fredericks demonstrates one should not judge a book by its cover and that friendships—even broken ones—can still run deep and true.